Some fifteen rugs from the churches of Transylvania and the Museum of Applied Arts in Budapest, with a variety of field, spandrel and border designs, belong to a 'second period', circa 1625 to the mid-17th century. In all, there are probably no more than sixty surviving first- and second-period 'Transylvanians', including those in Western collections. The same star and cartouche main border found on the first-period rugs is used on most of the second-period examples, although there are exceptions, such as the beautiful large leaves on a meandering stem seen on this rug. 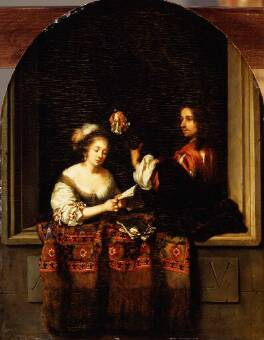 Such a border is rarely seen on carpets depicted in European paintings, but one example can be found in Gaspar Netscher's Couple Making Music in an Arched Window Bay, 1665, in the Gemaldegalerie, Dresden. 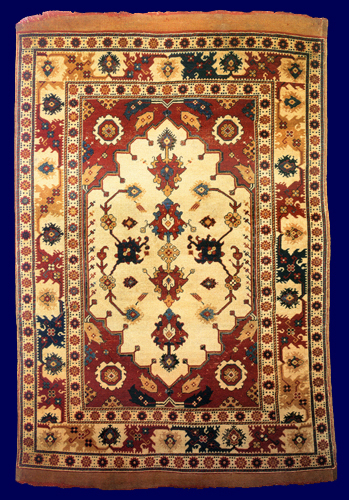 Most rugs of this type have the traditional field design, with the lamps seen on the first-period rugs sometimes replaced with large flowers, as here. The majority have a large octagonal-shaped flower with two half-rosettes and large leaves in each of the four corners of the field.